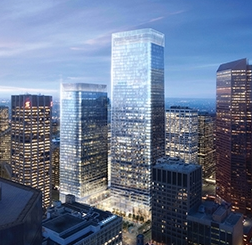 The recently completed Bow Office Tower’s reign of being the tallest building in Western Canada will be short lived as Brookfield Properties began construction on Brookfield Place this fall. The 56 storey tower will be 247 meters tall, surpassing The Bow by 11 meters. One million square feet of the 2.4 million square feet of office and retail space has been pre-leased by Cenovus Energy. The building is located on the site of the former Calgary Herald Building on 1st Street SW. A second tower of one million square feet is planned for the west side of the site where The Bay Parkade now stands. The Bay Parkade will remain operational until construction starts on this second phase of Brookfield Place. No date has been announced for this yet.